Enjoy best, short and funny Bhai status in Hindi for Whatsapp, Facebook. Get new, unique Bhai quotes in Hindi, English for behan or sister. Only latest Bhai status quotes or messages in Hindi. So you have younger or elder brother and you want to share some heart touching quotes or status with them in Hindi? Then enjoy our best and short Bhai status in Hindi for Whatsapp. Can read: Best Brother status for Whatsapp, Facebook. Can read: Most popular sister status for Whatsapp, Facebook. In case, you want brother status in Hindi but should be written in English font then again enjoy our short and hilarious collection on brother status or quotes in Hindi or English. Can read: Best of Maa status for Whatsapp, Facebook. Bhai dur hai to pyar badhta hai, use yaad kiye bina lamha nahi gujarta hai. Rakhi se lekar mithai tak ho gayi, ab to gift de do bhaiya raat ho gayi. Haldi ka chandan se rishta hai, bhai ka behan se rishta hai, Happy rakshabandhan. Tum jio hajaro saal mere pyare bhaiya, bas rakhi par gift dete rehna mere bhaya. Sharmilye bhai bhi behno ki raksha ke liye bold avtar lete hain. Shukriya mere khuda tune jahan banaya aur mere bhai jese dost se milwaya. Mere ankhon mein aansu wo dekh nahi payega, mera bhai tujhe bhabi chor jayega. Apno ka saath bhale hi chuta par bhai apni behan se kabhi na rutha. To dear behna, har janam meri pyari behna hi banna. Dost to samaya ke sath badal jate hai, bhai samay ko hi badal sakte hain. Apne to bure dor mein chor jate hain, par bhai bure dor ko hi badal dete hain. Mushkil ho ya assan, bhai log rahon per chalna sikha hi dete hain. Can read: Best parents status for Whatsapp, Facebook. We have just seen awesome Bhai status in Hindi, English. 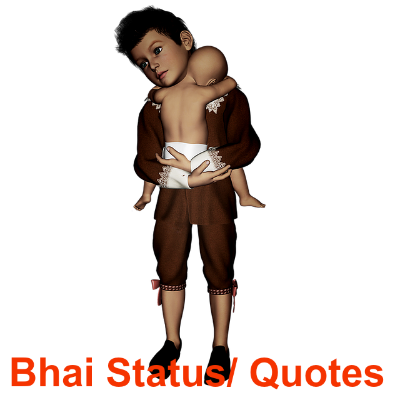 If you liked our bhai quotes in Hindi for Whatsapp, Facebook then enjoys our Whatsapp status collection. Can read: Short Whatsapp status, quotes for Son. Can read: Best beti status for Whatsapp, Facebook. If you have any query then share it with us otherwise, like us on facebook or tweet for us. It will motivate our team to write more innovative and funny Hindi status or quotes in English.